My review of the previous episode: The Pilot. Bill and the Doctor arrive in the distant future, where a group of mood-sensitive robots have gone rogue and slaughtered the crew of a small human colony. The main thing Bill wants to know about the future: is it happy? This is just the sort of question Bill would ask. As Steven Moffat pointed out, Bill is a pretty genre savvy companion, and she’ll be wanting to know if we’re looking at a dystopian or utopian future (it can only ever be one, if the movies are to be believed). Judging from the bright colors, we’ve landed in an optimistic world. The colony is strikingly realized, with vast open fields beneath a looming, white, modern edifice bringing to mind the sterile, white world of Apalapucia in The Girl Who Waited. Of course, all is not as it seems. It doesn’t take long for Bill and the Doctor to stumble onto the bones of colonists turned into fertilizer. They then spend much of the episode trying to figure out exactly what happened to the colonists, and how they can prevent the robots from slaughtering more people. The central idea in Smile is that emojis—and facial expressions themselves—are employed to hide our true feelings. Which is obvious, of course, but Smile pushes the concept a bit further. We shun grief and awkward emotions, anathematizing depression. 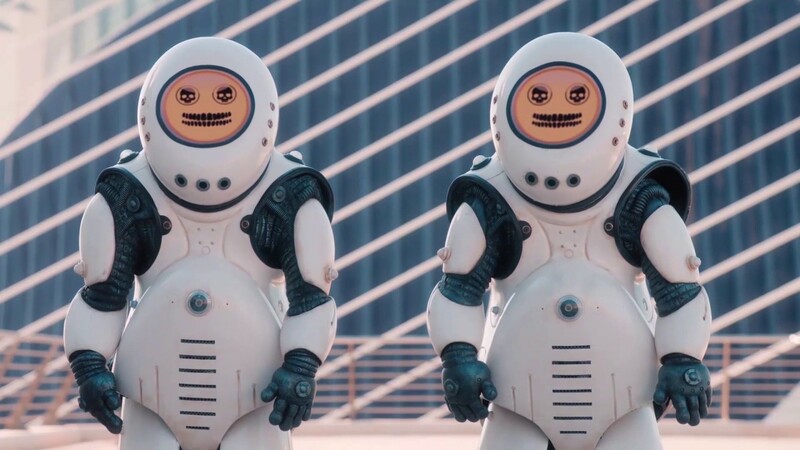 Emojibots literally exterminate anyone who displays fear or grief. In a world where showing dark emotions can literally kill you, there’s even more pressure to put on a good face. That’s an interesting idea, with a lot of promise, but the ending doesn’t live up at all. A solution as simple as turning the robots “on and off again” does no justice to the story’s conflict. The whole point about difficult emotions is that there is no quick fix. They take hard work and understanding, not just the flip of a switch. On the other hand, the character work in this episode is solid, as Bill gets to know the Doctor, and the Doctor gets to know Bill. They explore the barren colony and he tries to drop her off at the TARDIS when it looks like danger. Bill, however, isn’t about to be left behind. 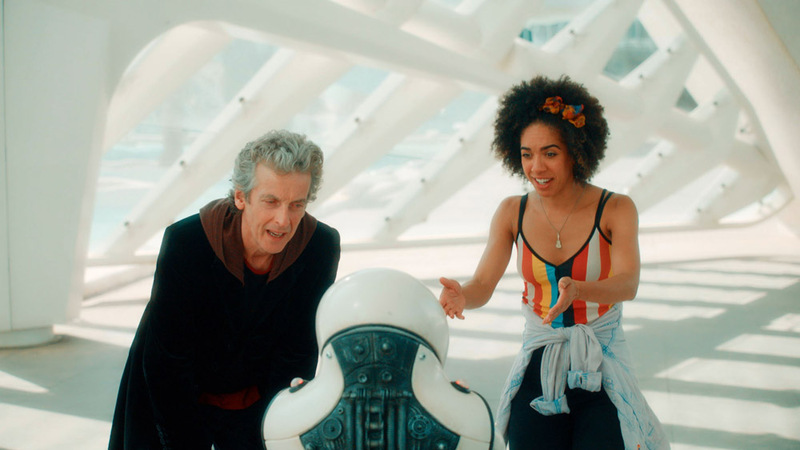 The Doctor’s clearly beyond the “I must protect everybody because I’m haunted and can’t lose anyone again” stage of grief, so he lets her tag along. Speaking of grief, it’s surprising that the situation doesn’t take the opportunity to examine the Doctor’s rather complicated emotional life. Rose, Amy, and Donna all got a glimpse of the Doctor’s grief and responsibility in their second episodes as regular companions, and Clara got an even more dramatic recital of the Doctor’s age and experience. In the space of ten seasons, the Doctor’s run the gamut from vengeful anger to haunted PTSD to whimsical disassociation to utilitarianism bordering on nihilism. There’s a lot there. But if there’s anything we know about this Doctor, it’s that he is good at concealing things. He doesn’t have time to care. And this season has taken a noted turn for the lighter after the grimness of series 9. That lightness is this episode’s saving grace. Both of the episodes so far have been lightweight adventures, but they’ve used the time productively, taking a while to reintroduce us to the Doctor’s world. Hopefully, that pays off, but in the meantime, the stories have been unimpressive. My review of next week's episode: Thin Ice. I’m still thinking about who’s regenerating in the “Coming Soon” trailer. It’s occurred to me that there are quite a few Time Lords who might turn up in this season. There’s the Doctor, of course, but we also know there are at least two incarnations of the Master running around. If Susan Foreman does return, that throws another wrench into the works. The figure in the trailer looks male, but it’s entirely possible that one of the women could regenerate into a man. And, of course, we could see a fake-out regeneration, like David Tennant pulled off in Journey's End. Steven Moffat, you like to torture me, don’t you?